Following this summer’s ScGateway release, Incident Command will be deployable to those of you who are interested in purchasing it. The Incident Command module extends SAFEcommand Response by adding the ability to plan and manage operations at an incident site from the moment the first responder arrives to the moment the last resource leaves. 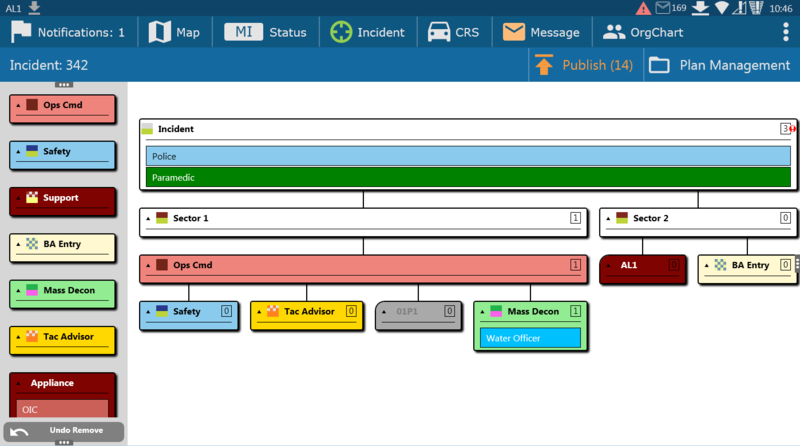 Deployed into command vehicles on a laptop or PC, or into operational vehicles on a ruggedised tablet PC or Mobile Data Terminal, the Incident Command module provides organisational structure planning and role allocation to incident sectors with visual planning tools. Additionally, real-time resource location enables key safety and operational information to be recorded. Information captured is shared in real-time with other Incident Command module users deployed to the same incident through SAFEcommand Gateway, providing a common operating picture to all. Incident Command is built on top of ScResponse and integrated with ScGateway for direct communication with the Command and Control and other MDTs on the same Incident. This gives the Incident Command user an integrated view of the incident ground with real time ARL data and the ability to share their visual plans and decisions with the C&C or others at the Incident. We are offering a discount to early adopters of Incident Command and are looking to work with the first few customers to develop the next set of features which will be added to the software. If you are interested please let us know by logging a call.